First, prepare the mushrooms. Heat the oil, once hot – add the butter. Add mushrooms and cook for 4 minutes. Add thyme leaves, cook for another 2 minutes and remove from heat while there’s still liquid in the pan. Reserve for the risotto. Start the risotto next. In a medium/large pot, heat the olive oil over medium heat. Once hot, add the rice, stirring constantly for about 1 minutes. Now, add the white wine. Stir constantly until most of the liquid is dissolved. Add 1/2 cup of the chicken stock. Stir constantly. Repeat the process until the chicken stock is gone. Add mushrooms when only 1/2 cup or so of chicken stock is left. For the fish: Mid-way through your risotto-making process, delegate the stirring duties to your partner in the kitchen. Heat the oil in a stainless steel skillet. Combine seasoning and rub it on the flesh-side of the fish. Once the oil is hot, sear it for 3 minutes, skin-side up. Transfer to the oven for 5 minutes. Remove from the oven, flip the fish, and cook for one more minute. Hopefully your risotto just finished up too! 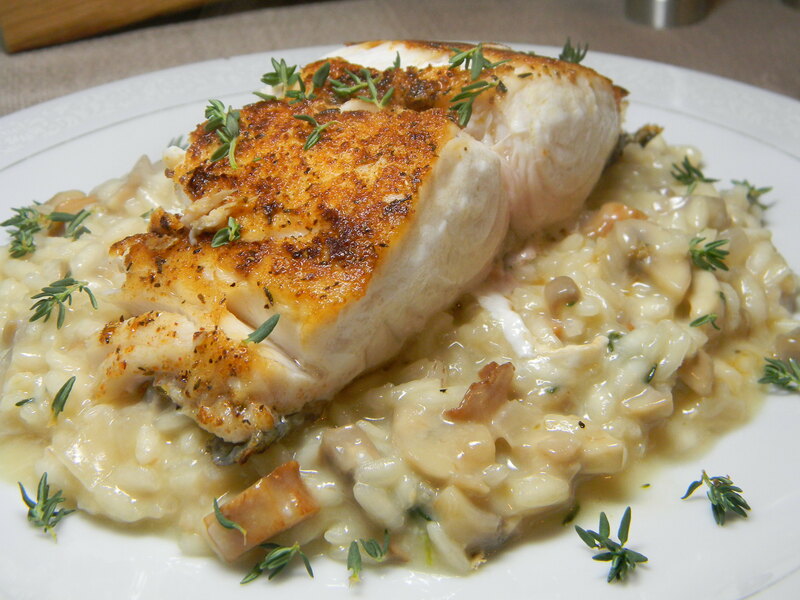 Plate the risotto first, topped with the fish, and garnished with more fresh thyme leaves – Enjoy! * We usually don’t use seasoning blends, but highly recommend this spice mix from Penzey’s. When you only need a small amount (ie, 1/4 teaspoon), it’s nice to have just the right blend of flavors without adding a pinch of this and smidgen of that.